That is just one of the findings from a study detailing how citizens use a variety of sources to learn about and stay connected with their local communities. Overall, the survey found that Americans are integrating their use of both traditional and non-traditional news sources to stay informed about local news and information, and that the sources they use vary depending on the local topic they are following. As noted in the initial report based on these data,1 local television news and the local newspaper are still the preferred media for many topics. At the same time, the internet has become a highly relied-upon source for many types of local information, particularly among younger adults. This follow-up report takes a closer look at one unique group of local news consumers – those who follow local news closely “most of the time, whether or not something important is happening” to examine if, and how, they differ from other citizens who are less interested in local news. Who are these local news enthusiasts? What do they look like demographically, and how do they differ from others in their overall attitudes and habits, their use of technology, and their news consumption habits? What local topics are important to them, and how do they gather information about these topics? Is there a reason to think this group will grow in size? The answers to these questions are important for the civic life of communities and the variety of news and information services – and advertisers – that are trying to serve customers in local markets. 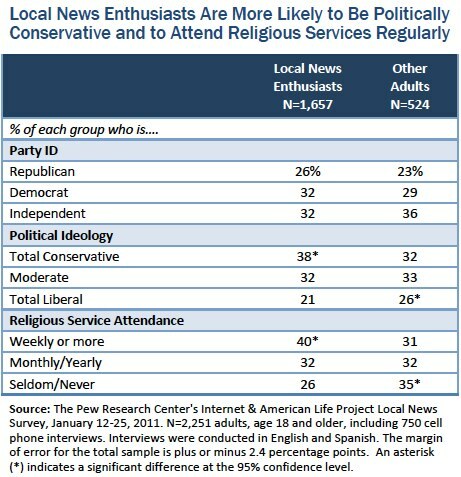 Who are local news enthusiasts? As a group, local news enthusiasts differ demographically from others in important ways, in their use of technology, the information that is of particular interest to them, and their local news habits. Demographically, local news enthusiasts are more likely than other adults to be female, age 65 or older, retired, and African-American. Politically, they tend to be conservative in their outlook (although they do not differ from others in party identification) and they also attend religious services more frequently than others. They do not differ from other adults in terms of household income, but are less likely to be college graduates. 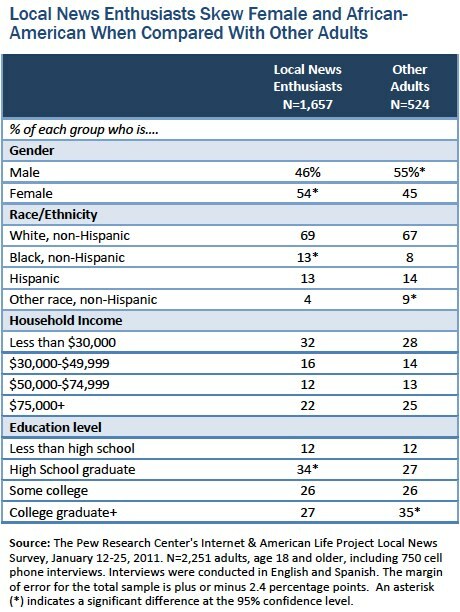 Despite their older age relative to other adults, local news enthusiasts are still fairly diverse generationally – one quarter are Generation Y (ages 18-34), about two in 10 are Gen Xers (ages 35-46) or Younger Boomers (ages 47-56), and roughly one in 10 are older Baby Boomers (ages 57-65), in the Silent Generation (ages 66-74), or from the G.I. Generation (age 75+). 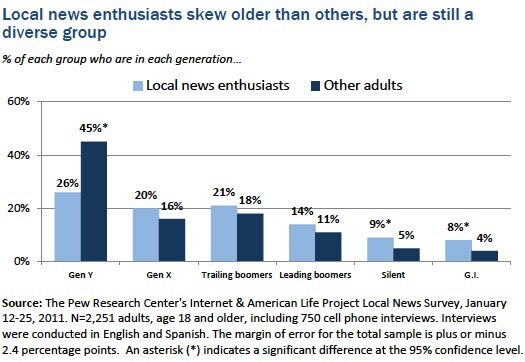 Less enthusiastic followers of local news, in contrast, are more heavily concentrated in Generation Y (45%). As a group, local news enthusiasts use the internet, cell phones, social networking sites and other technology about as much as those who follow local news less closely. 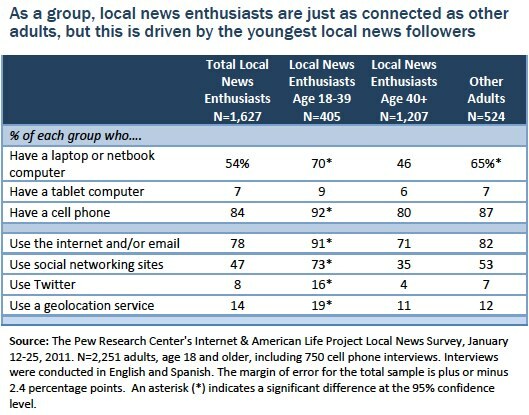 Yet, the connectedness of this group is driven largely by younger local news enthusiasts (age 18-39) who are much more digitally connected than both older local news enthusiasts and adults who do not follow local news closely most of the time. For instance, 91% of younger local news followers are internet users, compared with 71% of local news followers age 40 and older, and 82% of adults who do not follow local news closely. While they are less likely than other adults to have a laptop or netbook (54% vs. 65%), there is no significant difference between local news enthusiasts and others in rates of cell phone ownership (84% vs. 87%) or tablet computer ownership (7% vs. 7%). 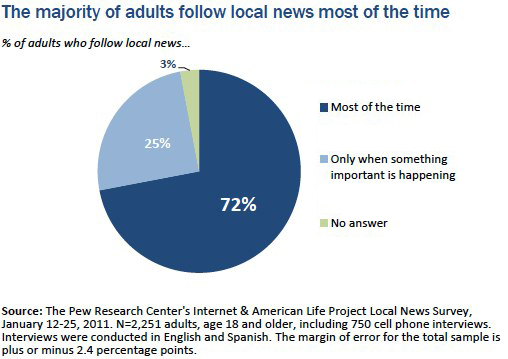 And, perhaps surprising given their slightly older age profile, local news enthusiasts are just as likely as other adults to consume local news and information on their mobile devices (47% v. 50%).